Nearly 2,000 families who fled Puerto Rico after Hurricane Maria could once again find themselves without a place to live if a federal court allows the US government to cut off housing subsidies for people displaced by the storm. One of those families is led by Betzaida Crespo. 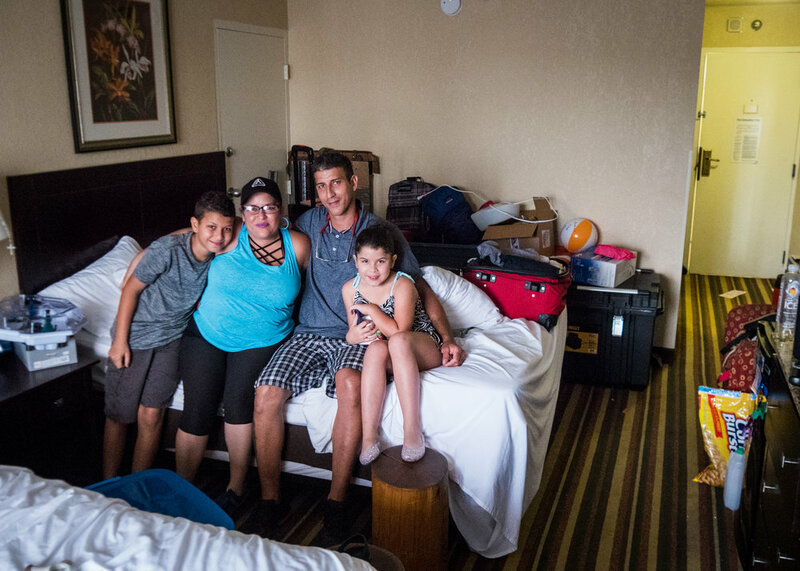 Betsy, as she’s known, left Dorado, Puerto Rico, in November with her husband Erín and their young son and daughter after their home was severely damaged by the hurricane. Like an estimated 150,000 other Puerto Ricans, the family boarded a plane to Florida. When they arrived in Orlando, they signed up to receive temporary housing aid from the Federal Emergency Management Agency. They moved into a room with two queen-size beds at a Holiday Inn just down the street from Disney World, and they’ve lived there ever since. The room has all the trappings of any young family’s home, condensed into less than 200 square feet. The walls are lined with plastic footlockers that have been jammed full of clothing. Action figures are piled on the floor next to tools belonging to Erín, a handyman. Ramen and canned food are stacked on a rickety table alongside a single electric burner and a rice cooker. A bouquet of fresh-cut flowers fills a pink plastic water bottle on the window ledge. Living in this cramped space has put the whole family on edge, Betsy says. Their months-long search for their own apartment—on what Erín can earn from odd jobs, in a sprawling metropolitan area with one of the country’s worst affordable housing markets—has been unsuccessful. Betsy struggles with crippling anxiety and depression and suffers from back pain caused by scoliosis. She has bad credit from a dispute with a previous landlord. After she gets her children to sleep and steals a rare private moment with Erín in the bathroom, she often lays awake until 4 a.m., scrolling aimlessly on her phone. Her mind constantly circles the same question: What next?